Pankaj Batra is very well appreciated and known Punjabi film director in Pollywood film industry, he has given some of the best movies to Punjabi cinema and some of them are Bambukat starring Ammy Virk, Channo Kamli Yaar Di starring Binno Dhillon and Neeru Bajwa, One of the very successful movies include name of ChannaMereya which was Ninja’s debut film and was remake of famous Marathi movie Sairat. Pankaj Batra’s work as a director has always been appreciated in the industry also at box office his movies do a good business. He is now back with all new project, and is coming up with film High End Yaariyaan in 2019. Starring some of the very well-known artists of Punjabi industry. 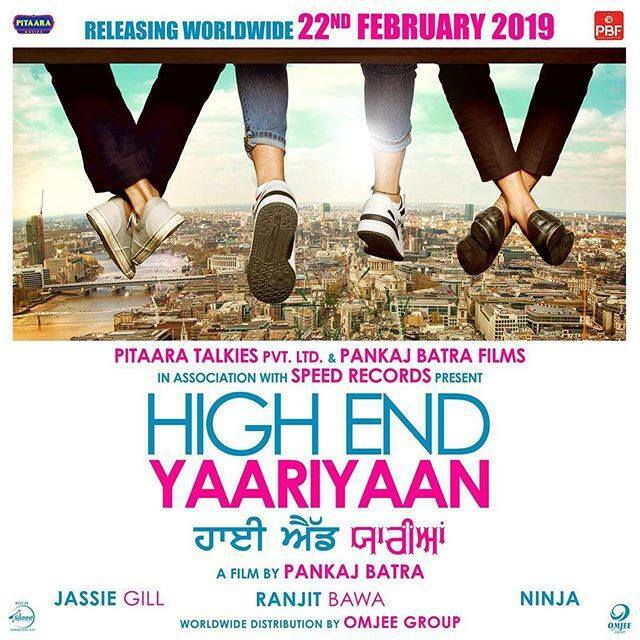 Jassi Gill, Ranjit Bawa and Ninja are leading star cast of High End Yaariyaan Movie. Three of them started their career as singers and now are doings films as well. This will be Ninja’s second film after ChannaMereya while Jassi Gill and Ranjit Bawa has been doing some films previously. Jassi Gill came to industry with his debut track Lancer in 2012 after which he become very famous and then released number of songs like VichPardesan, 3 Saal, GaatiGutti, Yaar Jatt De, Snap Chat, Laaden and many more. Jassi Gill movies list is like this, Channo Kamli Yaar di, a Bollywood movie he recently did with Sonakshi Sinha, Happy PhirBhaagJayegi, Sargi, Mr.&Mrs. 420 and many more. Ranjit Bawa entered to the industry as a folk singer and came up with very unique and different track named as Jatt Di Akal. The track was loved by people and then he came up with Jean. All his songs were hit on hit and there he made his debut in films as well. Firstly he was provided some supporting roles but soon he came up as a leading artist of the films. Ranjit Bawa has done Pollywood movies like Sarvann, Bhalwan Singh, Toofan Singh. He is well known for songs like Jean, Jean 2, Dollar Vs Roti, Truck Wale, Chandigarh Returns, Mitti Da Bawa, Weekend, MeriyeSardarniye and many more. Ninja also entered as a singer in Punjabi industry and his debut track Aadat was very well appreciated by everyone, for a while he was not into doing movies or acting but later made debut in Channa Mereya and the film was a huge hit. People loved him as an actor as well, and now he will be seen in Pankaj Batra’s High End Yaariyaan Movie. Ninja Songs have become super hits of all the times and some of them are Roi Na, Oh Kyu Ni Jaan Sake, Aadat and many more. High End Yaariaan movie plot and story seems to be based on life of three friends who have different stories about themselves and how they tackle their problems by helping each other at various points of life. Poster of High End Yaariyaan has been released on 15th October 2018 and shows 3 friends sitting on a roof top while only their legs are visible. The poster contains simple logos of partners and some information about the film. The release date of High End Yaariaan movie is 22nd February 2019. High End Yaariyaan is produced by Pitaara Takies Private Limited & Pankaj Batra Films. The worldwide distribution of the film will be done by Omjee Group.